On the convoy of 78 CRPF personnel going from Jammu to Srinagar, the terrorists attacked a number of militants in Pulwama, Kashmir. 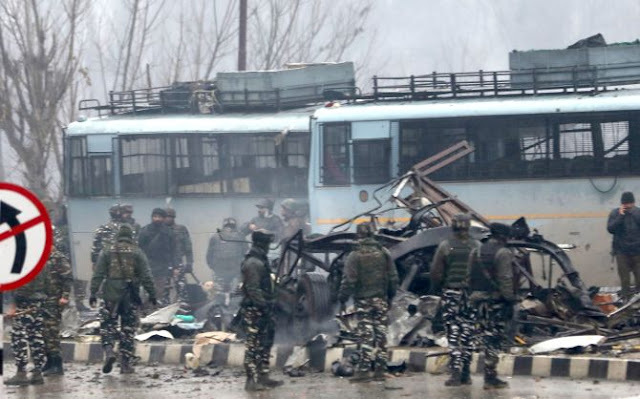 Vijaykumar, the adviser to the Jammu and Kashmir government, told that 40 soldiers were killed in the attack, many were injured. 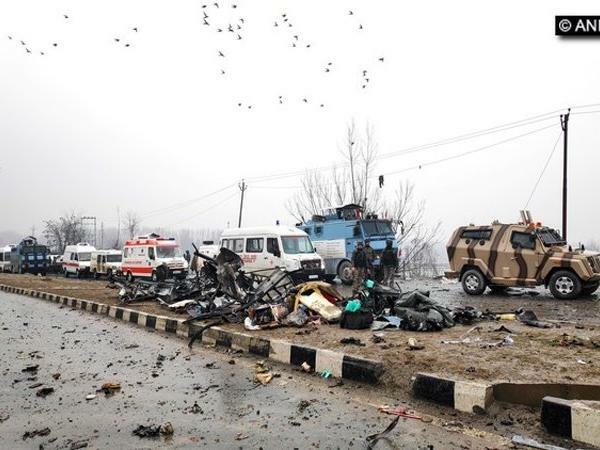 This convoy included 2547 soldiers Jaish-e-Mohammad took responsibility for the attack. The biggest attack by a car filled with explosives is by now. Earlier in October 2001, the Kashmir Assembly and the security forces in January 2004 were attacked in a similar manner. There were 38 deaths in the assembly attack. The terrorists of Jaish, Adil Ahmed alias Waqas commando attacked this fidayee at 3:15 pm He had filled the explosive in a car. As soon as the CRPF's convoy passed through Lethporora, the terrorists clashed with a bus filled with their jawans. It is being told that Adil had filled a 100-kilogram explosion in a car. Adil, a resident of Kakapora of Pulwama, joined Jaish in 2018. Prime Minister Narendra Modi spoke to Union Home Minister Rajnath Singh and National Security Adviser Ajit Doval. Rajnath Singh spoke to Director Intelligence Bureau and NSA Doval. Union Home Secretary Rajiv Gaba left the tour to Bhutan. Congress general secretary Priyanka Gandhi cancelled her press conference Said - not the time to talk about politics. The Cabinet Committee on Security Affairs will be at 9.15 in the morning. Tomorrow, the NIA's 12-member team will be pulling. An official said that the convoy had left Jammu at 3:30 in the morning and had to reach Srinagar before evening. The number of returning soldiers was high, because over the past few days due to bad weather the highway was not too crowded and there were also some administrative reasons. Usually, such convoys have one thousand soldiers at a time. But, this time their number was 2547. The road opening party and armoured anti-terror vehicles were also included in the convoy. The bus which was targeted for the attack was 76th battalion and it contained 39 soldiers. Modi said, "The attack on CRPF jawans in Pulwama is disgusting. The martyrdom of the soldiers will not be wasted, the whole country is standing with the families of the soldiers." Rahul also expressed grief over the attack. I am distressed by the move. " On October 1, 2001, Jaish-e-Mohammed terrorists attacked the Jammu and Kashmir Legislative Assembly. A suicide bomber was aboard an explosive-laden Tata Sumo. He collided with the carriage in the main gate of the assembly. There were 38 deaths in the attack. At the same time, on January 15, 2004, the terrorists attacked a convoy of paramilitary near Srinagar, with a car full of explosives. However, there was no casualty in this attack. 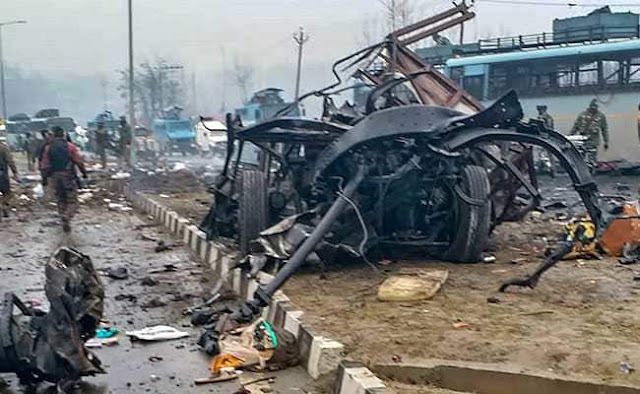 Jaish-e-Mohammad spokesman Muhammad Hassan told a local media that our organization takes responsibility for the attack on the convoy of the CRPF. This fidayeen attack was carried out by Adil Ahmed aka Waqas commandos. He used to operate from Gundi Bagh in Pulwama. According to reports, on June 2, 2018, the grenade was attacked on security forces in Badshah Chowk, Srinagar. The responsibility of this attack was taken by Jams. Earlier, the security forces burnt the house of the Waqas commando on the night of May 31. Vikas escaped in this encounter of the army.